Service Types is in the drop-down list of the General tab of the Work Order. It lists Job Type, Service Type, and whether or not the Service Type is internal. To open the Service Types window, click Service Types in the Setup module of the Configuration menu. Description – Describes job type. Image – Picture associated with job type. Create one Work Order per day – For Work Orders extending multiple days, checking this box will create one Work Order per day. Otherwise, one Work Order will include all days. Allow Fixed Pricing for Proposals and Work Orders – Sets fixed prices for proposals and Work Orders. Default Employee and Asset Hours from Operations Details – Takes employee and asset hours directly from the Operation Details grid of the Work Order. If this box is not checked, hours must be entered manually. Internal Only – Sets a Work Order for internal use only. Usually used for asset maintenance. Tip: Manage images using the right-click menu. Job Types are included in the drop-down list in the Work Orders General tab. 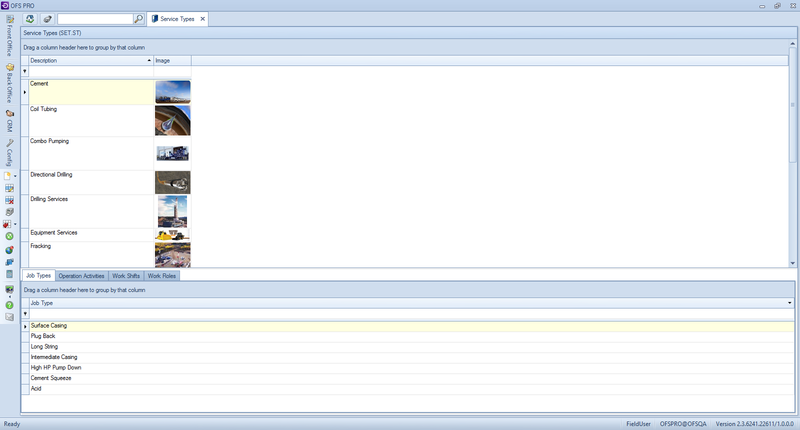 It is possible to manage Job Types by adding, editing or deleting them on the Job Types tab in the Service Types window. “Jobs” and “Job Types” are different functions. “Jobs” are used to tie Work Orders to the same Customer, while “Job Types” are different types of work. These entities are independent. While selecting a Job Type is mandatory for Work Orders, selecting a Job is optional. Job Type – Name of the new job type. Certifications – List of certifications necessary for this job type. 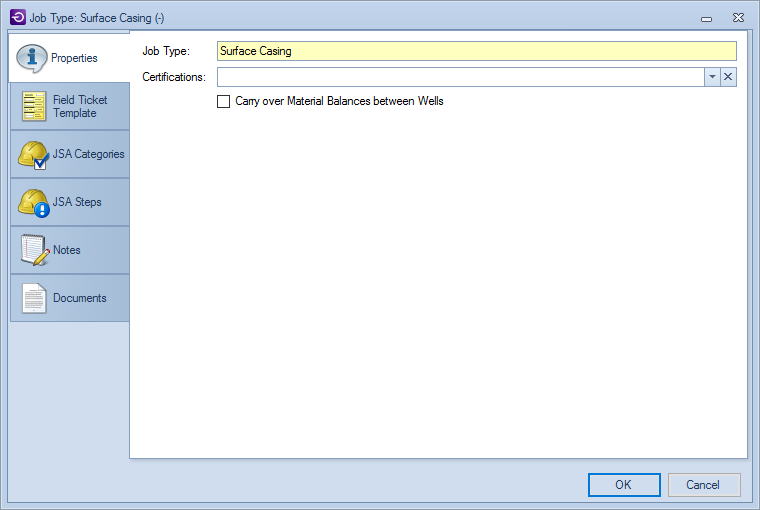 Carry over Materials Balances between Wells – Checking this box to enables carry-over between wells. The Field Ticket template is a list of Item Master items associated with this Job Type. When a new Work Order is created, the Field Ticket is pre-filled with items based upon the Job Type chosen. The field ticket template details include the following: #, Item, Description and Quantity. The Job Safety Analysis categories used in the Work Order window are customizable and depend on the Job Type selected for the Work Order. They can be customized in the JSA Categories tab of the Service Type window. To access to this configuration tab, navigate to the Configuration module in the main menu, click Service Types, then click the JSA Categories tab. The current categories are displayed in the data grid. To remove a category permanently, right-click the field and select Delete. Each category includes questions such as: Description, Sort Order, Active. The currently-displayed fields are shown in the data grid. To remove a question permanently, right-click the field and select Delete. Add a new question by right-clicking and selecting New. Job Safety Analysis Steps include the steps to complete a job safely. This option is customizable through the configuration module. To access it, click on the Configuration module, then in Service Types. To customize the Service Type, open its details window and click the Job Safety Analysis Steps tab. The Job Safety Analysis detail window includes the following: Sort Order, Job Step, Potential Incidents or Hazards, Recommended Action or Procedure, and Person Assigned To. The Work Order fields can be customized depending on the configuration of the Service Type used for that Work Order. Fields can be mandatory, not mandatory and/or hidden. To access the Customization tab, first click on the Configuration module in the main menu and click on the Service Types item, then click on the Customization tab. The current fields are shown in the data grid with checkmarks in the leftmost column. Click the checkmark box to see the display fields that are currently hidden. To hide a field, clear its checkmark. The Required column specifies whether a field should be required when a new Work Order is created. Select a preset configuration from the list by clicking an item.